A quilt is like a sandwich and is made of three layers. The top, batting and backing. The batting is what goes in the middle of the "quilt sandwich.” This little informational tutorial will discuss many different types and uses of batting (See 60 Uses for Batting ). You can choose from 100% cotton, polyester, cotton/polyester blend, bamboo, wool, silk, etc. What will the finished product be used for? Quilt, wall hanging, bed-spread, etc. Who will the end user be? Does it need to be flame retardant for children? Does it need to be especially warm? In a warm climate - does it need to breathe? How do I want the finished quilting project to look - flat or fluffy? Contemporary or traditional? Do I need a light or dark batting? These are the sizes of the batting if you purchase packaged batting at the local box store. Your longarm quilter will probably have batting on large bolts (usually 30 yards) and will charge you on a linear inch. It is always nice to support your local quilter rather than bringing your own batting. resist bearding better than any other batting. shoulders following the natural curve of your body without being too stiff. Loft: This refers to the thickness/puffiness of the batting. Cotton is generally low-loft, but it is available in several different thicknesses so you can find higher loft cotton batting. Low-loft batting is easy to needle and handle, and is soft and drape-able. Medium-loft batting adds texture, gives a puffier look, and is warmer, but the higher the loft the harder to machine and hand quilt. tiny needles. This causes the batting to be stronger and denser while being lower loft. Because of the denseness of this batting it isn’t generally good for hand quilting. These battings will tend to migrate but will not bunch and shift. Needle-punched batting can be thermal or resin bonded. Some brands may require pre-washing to remove oils, etc. Gives the flat look of traditional quilts. usually more expensive than polyester. Heavier once quilted, thus, may be warmer than polyester. 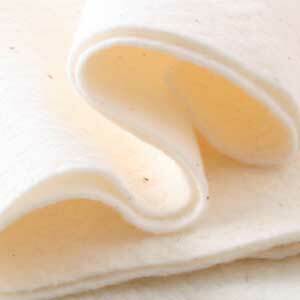 Made from natural fibers is favored for its soft texture and comfort. 100% cotton batting is usually 1/8" thick. Subject to shrinkage when laundered. Prone to bearding and pilling. May be quilted farther apart than some types of cotton or wool batting. May be harder to machine quilt on a domestic machine due to the extra puffiness. Makes a very lightweight quilt. Comes in a wide variety of sizes or widths. (therefore it is often used for show quilts). One of the more expensive battings. Retains warmth even when damp. As with all wool items, may be attractive to moths. Blends will usually have most of the pros and cons associated with both types of fibers they are made of; however, they are generally less expensive than 100% natural fiber batting, and can often be quilted further apart. Blends are typically 80% cotton and 20% polyester. It has the benefits of cotton, but with more loft. This is what most professional longarm quilters will offer as their desired batting of choice. It can be 'tugged' on and will stand up to the process of machine quiltling. For information about the manufacturing process go to the Hobbs Bonded Fiber website. At T-Shirt Quilts of Texas and Shadywood Quilts we only use the highest quality materials to complete your project. For more information, be sure to download our T-Shirt Buyers Guide to help you decide about your quilt maker.